The next round of catechists’ formation starts this coming February and is designed for the formation of the catechists of our diocese. The course is aimed at forming new catechists as well as supporting and refreshing existing and “well-seasoned” catechists. This next series is to be hosted at St Patrick’s parish hall, Brockworth. The course will run on a Wednesday evening, once a month through to March 2019. Starting Wednesday 28 February, the course includes the diocesan gathering on Saturday 30 June 2018. There are some engaging and stimulating facilitators for each session. The session on 28 February is designed to set the scene for the monthly sessions that follow. There’s plenty of parking at St Patrick’s, sessions start at 7.30pm with refreshments from 7pm. 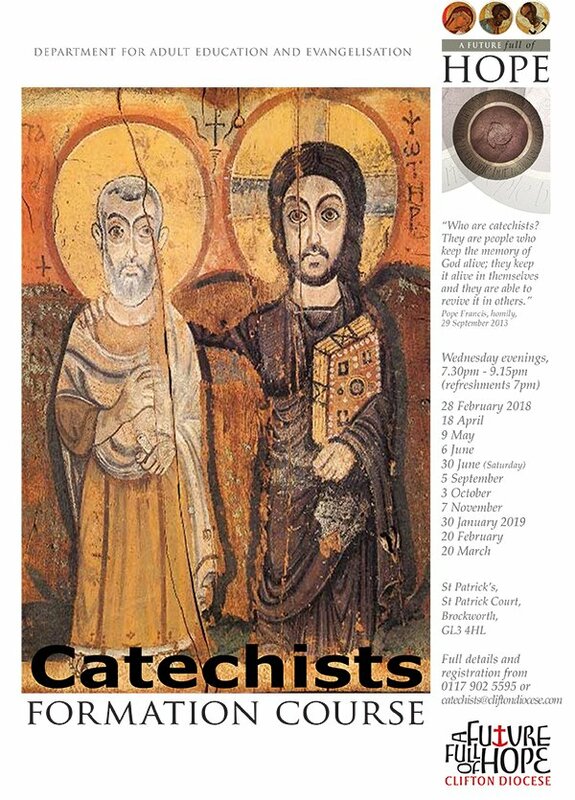 Further information can be found on the Catechists’ Course booklet link below. Those wishing to take part in the series will need to send their registration details to Alexander House, 160 Pennywell Road, Bristol, BS5 0TX by the end of February. There is a minimal cost to the course of £50 which may be subsidised by your parish. Cheques are to made payable to Clifton Diocese. The details are on the booking form. This Year of Mission invites us to consider ways we build up God’s kingdom and the way we draw others into friendship with Christ. As we are encouraged to deepen the faith handed on to us and the faith we profess, the hope is that this series will only encourage and enthuse those who take part in it to be confident in the faith they seek to hand on to others. This course may be for you or it may be for someone you know… it would be good to see you there!